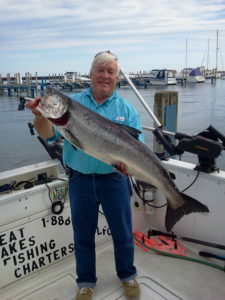 Great Lakes Fishing Charters LLC has been serving fisher-men, women and children for over 20 years. Our business continues to grow through referrals and repeat business. Fishing is a lot like real estate. It’s all about location. One of the first things that every fisherman learns is that fish have their own agenda which causes them to move over time from one place to another. This change can be seasonal, daily, caused by wind, changing water temperature, changing water clarity, the movement of bait they feed on, or the instinct to spawn. Experience and research are the tools that help build the pictures of where and when to find the fish you are looking to catch. Ever wonder why you can fish aboard a charter boat, catch fish and then go out yourself and not be as successful. It’s all a matter of understanding the water and the habits of the fish you are targeting. Experience and understanding make it possible to catch fish day after day. There are enough fish out there for everyone. Some Captains are very secretive or protective of “their” fish and may not agree. But look at it this way: Success breeds Success. If we can help you become a better fisherman, you will remember in a good way, and ultimately we will benefit too. Even a charter captain can have a tough day on the water. It sure is nice to have other captains and fisherman to talk to on the water if needed. After all everyone wants to catch fish. That’s what makes chartering so popular. 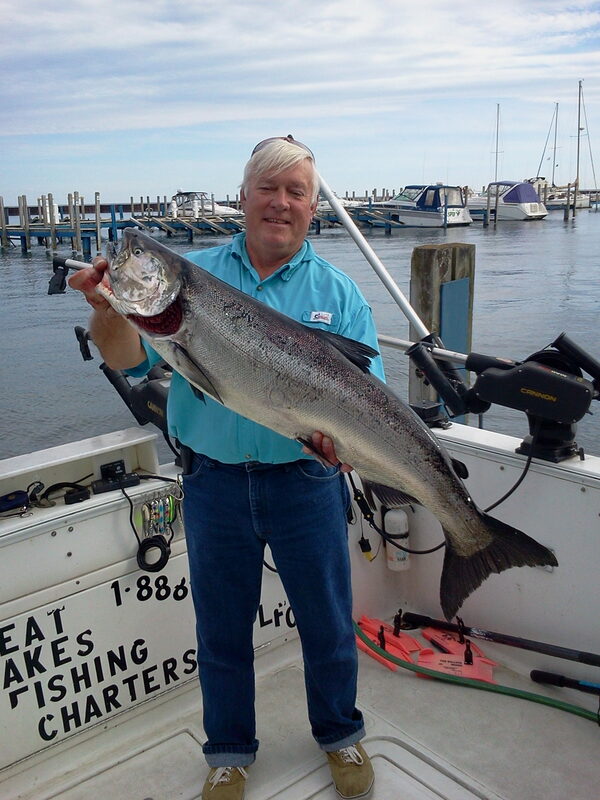 Putting our customers on fish has kept Great Lakes Fishing Charters LLC growing for over twenty years. Safety is our first priority. Sea worthiness and safety aboard our boats is at the top of the list. Redundancy in systems and equipment adds safety. Twin engines are a must in our book. Back up Depth Finders, GPS, Chart Plotting and Navigation units, Radar, VHF, EPIRB, and more demonstrate our commitment to your safety while aboard our vessels. We are licensed, insured, and inspected. We have gone well beyond the USCG and MDNR requirements. hooked and hooked again are regularly inspected and certified by the MDNR for charter boat use. Our Captains are credentialed / licensed by the United States Coast Guard as Merchant Marine Officers. Our Boats: GLFC went the extra distance (and dollar) looking for boats built to the highest standards for safety, strength, hull integrity, stability, comfort and for layouts ideally suited for the various types of fish we catch. See the section titled “Boats and Equipment” for a few pictures and more about how our vessels rigged.